MBBS is high merited course in Pakistan so many students fail to get admission in medicine in Pakistan. We advise you not to worry and get admission in China. Those students who have more than 65% marks in Intermediate can apply for MBBS in China. MBBS in China is not at all costly and you can study in one of the top universities in China “Southeast University”. SEU is one of the most prestigious universities in China and is ranked in top 30s universities in all over china; SEU is situated at the city center of Nanjing. This city is about two hours away by air from Beijing & 3 hours away by train from Shanghai. SEU is one of the national key universities administered directly under the ministry of education of China. It is also one of the first universities accredited by the state council to determine and approve the qualifications of professors, associate professors and doctorial supervisors. 1. English is the medium of instruction with outstanding Standard of education. 2. Excellent environment for female students. 3. No TOEFL / IELTS. 4. No hassle for Visa, No visa fee, no need for Bank statement for Pakistani students. 7. Annual Food and Hostel = 1000 US$. (Pay upon Arrival in China). Southeast University (SEU) is one of the national key universities administered directly under the Ministry of Education of China. As a centennial prestigious university, it is located near the city center of Nanjing, to the west of the Purple Mountain and the south of Xuanwu Lake. Southeast University is one of the oldest institutions of higher learning in China, whose origin can be traced back to 1902, when it was founded as Sanjiang Normal College. In 2000 Nanjing Railway Medical College (which is listed by WHO), Nanjing College of Communication and Nanjing Geological School were merged into Southeast University. 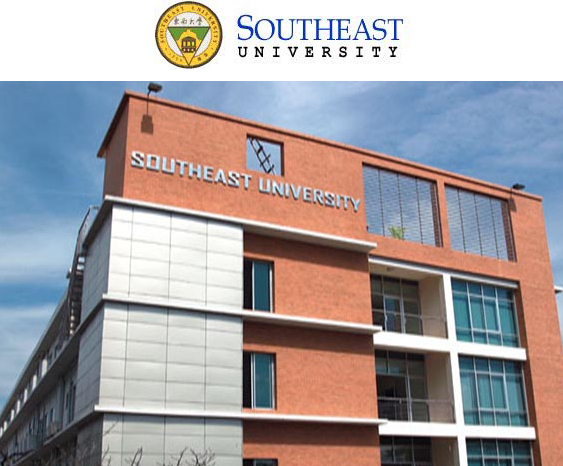 Now Southeast University has developed into a comprehensive university, boasting over 40 schools or departments with 60 undergraduate disciplines in all. It also has 15 post-doctoral stations, and offers 105 PhD programs and 200 Master programs; it holds a national lead in architecture, civil engineering, electronics, information technology, energy, power engineering, and transportation technology, etc. Southeast University has the total number of faculty and staff of about 6000, including over 1500 professors and associate professors, 300 doctoral supervisors, 7 academicians of the Chinese Academy of Sciences and Academy of Engineering. At present, the number of the full-time students is over 26000, of whom about 9000 are postgraduates. Southeast University places equal emphasis on research. It is one of the top 10 universities in scientific research and development in China, with over 20 national or provincial research institutes and a number of key research bases. Southeast University, with the principle of pursuing perfection, encourages the spirit of rigor, truthfulness, unity and diligence. In the development of Southeast University, international cooperation & exchanges play an important role. Since 1978, more than 4000 teachers or researchers have been sent abroad for academic activities or exchanges, and over 3500 foreign experts and teachers have been invited to our university for lecturing, cooperative research or academic exchanges. Up to now, more than 2039 international students from 60 countries have studied in this university. We have signed agreements of cooperation with more than 100 universities, research institutes or corporations in the countries such as Australia, Britain, Canada, France, Germany, Italy, Japan, Korea, Vietnam, India, Singapore, Switzerland, Sweden and United States. We have built a new campus in Jiangning, situated in the development zone of Jiangning district in the south part of Nanjing, covering the total area of more than 246 hectares, with convenient transportation and beautiful natural scenery around it. The new campus was put into use in Sep. 2006, providing our teachers and students with better facilities and accommodation. We warmly welcome international students to study at Southeast University, where you’ll enjoy a rich and rewarding academic experience.